The purpose of this article is to consider some aspects of working with a book publisher as it pertains to landscape photography. The themes of the article will be based around a recent publication of my own called ‘Mull, Iona, and Staffa’, which is my third book of landscape photography. 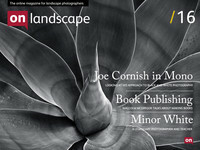 I will also comment on books produced by other well known photographers. Publishing a book of photographs, on a specific theme is a very satisfying enterprise and an essential part of any photographer’s livelihood. Making money is not the objective, but it gives the photographer a certain profile and photographic purpose. This article concentrates on the business of working with a publisher. The main advantage that publishers have over self-publishing is that they get books into bookshops.